Flakne, Gary W. Age 81, lifelong Minnesotan, passed peacefully into the arms of the Heavenly Father on January 3, 2016 after a short illness, surrounded by his many friends & family. Preceded in death by parents, Kleve and Jean; brother, Robert (Marion). Survived by wife, Patricia; children, Brian (Victoria Rico), Ross, Keith (Diane), Mark, Alison (Steve), Dona and Leslie (Chuck); grandchildren, Jessica, Kathryn, Cameron, Tyler, Stephanie, Michelle, Dan, Brianna, Isaac, Veronica, Adam and Connor. Gary graduated from Shattuck School, the University of Minnesota and William Mitchell Law School. He practiced law from 1960 until his death, while also serving 6 consecutive terms in the Minnesota Legislature, followed by 5 years as the Hennepin County Attorney, and later several years as a part time Referee in Hennepin County. While Hennepin County Attorney, the office won national awards for programs to assist the victims of crimes, and he personally tried the State v. David Forbes case, the first prosecution of an in-hockey game criminal assault in U.S. history. Gary retired as the Judge Advocate General for the Minnesota National Guard and later served with the Minnesota Reserves, attaining the rank of Colonel. He was also an instructor of business and constitutional law at Metropolitan and Normandale Community Colleges and legal writing at William Mitchell. Gary acted in his first play while at Shattuck and thereafter performed for the Old Log Theater, the Brave New Workshop, the Parkway Players, the Bloomington Civic Theater, and the Wooddale Drama Ministry. He was a TV talk show host for "Capitol Approach" on Channel 11, "Flak on Five" on Channel 5 and hosted call-in radio shows for WDGY and KSTP. Gary was also an election analyst for KARE-TV and a political panel member for Almanac. A lifelong Republican, Gary chaired numerous district and county nominating conventions, and was an alternate and delegate to two national conventions. 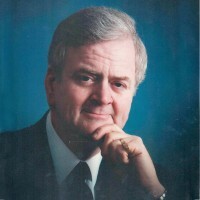 Gary served on numerous volunteer community and law association related boards. Gary enjoyed fishing for Rainey Lake walleyes and Gulf Coast tarpon. He loved the Gophers and the Vikings, cheering for both in good and bad times. Gary was proud of his Norwegian heritage and his 50 year membership in Torske Klubben, and membership in the St. Paul Club, where his story telling skills and sense of humor were legendary. Gary was a lifelong believer, active in Nokomis Heights Church in south Minneapolis, and as a greeter and drama team member at Wooddale Church, where his funeral will be held on January 8, 2016. Reception starting at 9:00, services at 11:00, followed by fellowship and refreshments at Wooddale Church, 6630 Shady Oak Road in Eden Prairie. Private interment. Special thanks to the ICU staff at Fairview Southdale Hospital for their gifts of care and compassion. Flowers or donations to Shattuck-St. Mary's School or the University of Minnesota, Torske Klubben Fellowship.